It could not be a better start for Bangladesh in ICC Women World Cup Qualifier. 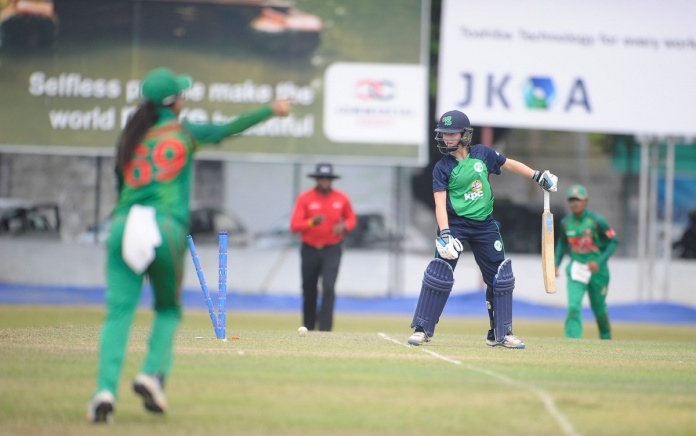 They have beaten Ireland by 7 wickets in the first match of the super six stage. After winning the toss, Bangladesh captain Rumana chose to field. Jahanara gave a dream start by grabbing 2 wickets between 15 runs. Ireland then tried to make amends by building a solid partnership in the 3rd wicket. Then Khadija Tul Kubra gave the crucial breakthrough by dismissing Meg Kendal and broke the 45 run partnership. But Salma Khatun grabbed the priceless wicket of Clare Shillington. Laura Delany and Isobel Joyce tried to rebuild the innings, but Bangladesh took wickets in regular interval. Eventually Ireland was all out for 144 in 44.1 overs. Jahanara grabbed 3 wickets and Panna, Rumana and Khadija took 2 wickets each. Chasing the modest total, Bangladesh openers gave a modest start of 40. Then Bangladesh lost 2 wickets between 13 runs. But Sharmin Akhter scored a defying knock of 52 runs and paved the way for the team. After her departure on 106 runs, Fargana and Rumana guided the team to a comfortable victory of 7 wickets. Jahanara was elected man of the match for taking 3 wickets. Bangladesh will face India in their second match of super-six on Friday.